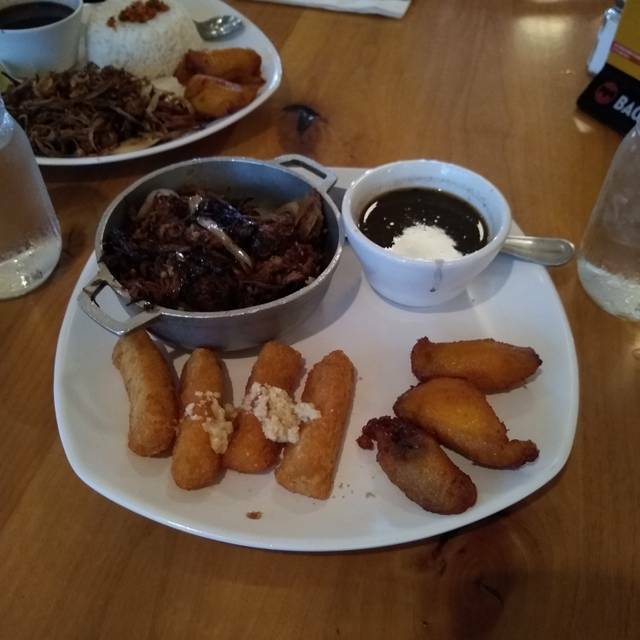 You must make reservations at least 5 minutes in advance of the time at 90 Miles Cuban Cafe - Lincolnwood. The Gonzalez family came from Cuba on June 13, 1980 on a shrimp boat from the Mariel Harbor Cuba. After 15 hours in a stormy black sea they finally reached Key West, only 90 Miles from their beloved Cuba. They immediately started working towards their American dream. 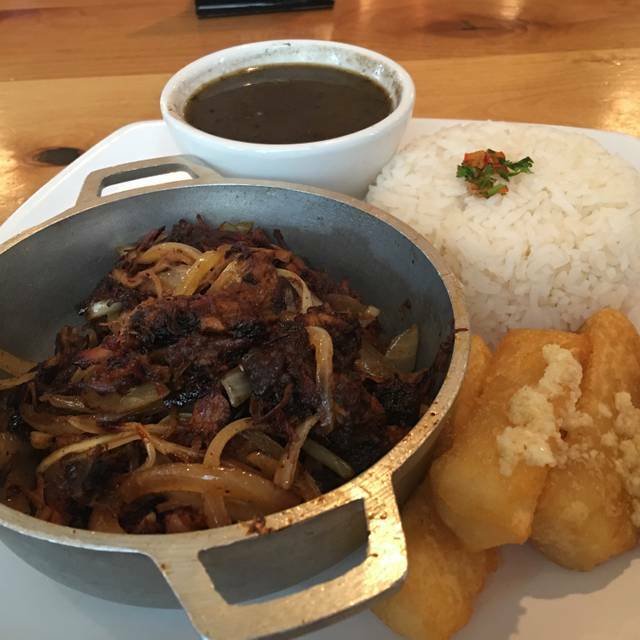 Their dedication has given them the opportunity to be able to share their essence of Cuban culture and authentic Cuban cuisine right from their kitchen table to you. They hope that at the end of your visit they have made a cultural impact on you that will make you come back to share it with family and friends. The food is always great and the seasonal cocktails were excellent. Our server, Wilfredo, was super friendly and took great care of us. Everything was great but when we got there they said they DO NOT TAKW OPEN TABLE RESERVATIONS ON SATURDAY NIGHT FYI. Thankfully the manger was nice enough and felt bad that we came from far away and gave us a table. Delicious food and loved the fast Service which allowed time to enjoy delicious drinks and music. The only draw back the music was really loud when the DJ playing , just a little lower would have helped us hear each other lol overall can’t wait to go back !! Waiting 1 hour for food! Tried to charge us for something we ordered but they never brought to the table! Waitress avoided us most of the time. Could bring at least some appetizers for one hour. 20 percent gratuity was included in the bill even if they didn’t deserve it. Bad management! All I can say! We went to 90 Mile Cafe on a Saturday night. We'd previously been to their place in Logan Square and had high expectations. This place in Lincolnwood did not disappoint. After parking was a little apprehensive as its located is a shopping mall but they did a good job with the interior of the place and creating a festive atmosphere. The drinks (Sangria) were very good as was the food. The service was good. Only negative was the hostess had a little bit of an attitude and could smile once in a while. Perfect Server. Perfect Food, Imperfect Happy Hour . The first Mojitos had little to no alcohol. The coloring of the drink was like water. The second round of Mojitos were great drinks. Same Bartender provided all drinks. A clear failure to be fair. A clear indication that they didn’t want to make the same drink with the same recipe with the same proportion of Alcohol. We didn’t say anything but we hope this doesn’t happen again . This was our first time there - and we will return . Wait staff had trouble understanding questions/requests. Service very slow. MaitreD didn’t know anything about my reservation when we arrived; I had made it a few hours prior. Despite that we were seated without any problem that Saturday night. Later live music in the main room was an unexpected treat. We will return to try more items on the menu. My husband and I have been here several times in the past year. We like several things about this place. Good food, good service, reasonable prices, and for us it is convenient. I try something different every time we go. My husband likes the Ropa Vieja and Palomilla sandwiches. We have a reservation for 6 people at 6 pm. Everything was good until we were told that we needed to leave our table because The table was reserved for 8:00. We probably would have left early if it wasn’t that our desert too so long to come. It would have been nice to know of the 2 hours limit on the table? No nice to be told after the effect. We were celebrating a birthday. We were there during happy hour. Our waitress did not know what the specials were. We even asked the manager to tell us what the happy hour specials were because we could not understand the waitress. 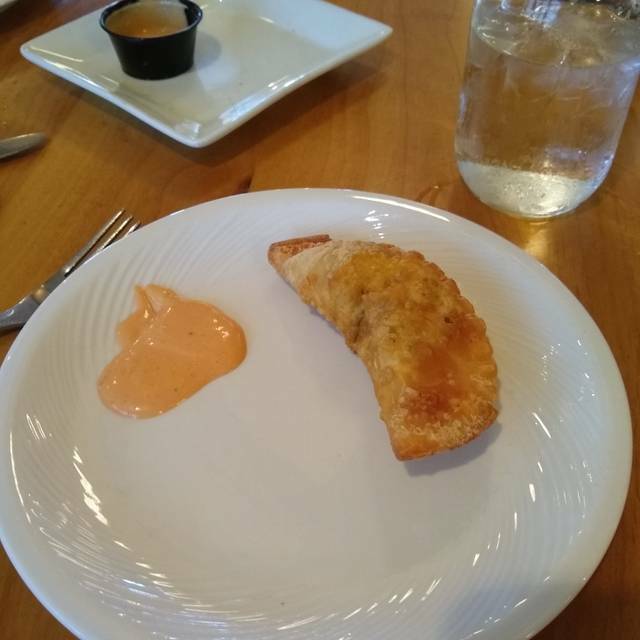 When the food and appetizers came, it was not as we had asked. I asked her to not put the garlic and the food. It came out with the garlic. When we ordered the desert, we mention to her that we were celebrating a birthday. The cake and the flan was nicely decorated with a candle and happy birthday. The waitress walked away, she disappeared for over 20 minutes. It was a slow night at the restaurant, so everybody in the manager were in the kitchen. The bartender was the only working staff in the front making drinks. We tried to get his attention so that we can ask our waitress for silverware to eat the cake. Before we could get his attention he disappeared into the kitchen. Now we had no wait staff, manager or bartenders in the front of the restaurant. When they finally came out of the kitchen I waived my hand for them to come over. The waitress went to another table, and the manager went to help another customer I was waiting to be seated When I finally got to the manager I explained how upset I was. I told him that I should not have waited over 20 minutes to get silverware In order to eat the cake that we ordered. I told him all the things that happened above and he apologize. I believe that this was one of the most unhappy experience at this restaurant. I had a great lunch at a great price! Very loud. Staff was not in synch. Ran out of skirt steak at 8pm. I was a bit surprised at how high the rating was. Honestly the food was not that great in my opinion. We love this restaurant. The food and service are great and the environment is fun. Our waitress was amazing . She made sure we were very well taken care of . Drinks where awesome. Service was poor, no one checked in on us! Food was okay, I expected more from a place like this. Our first time there. Somehow they didn’t see our Open Table reservation and we got seated in the back room where there several very large parties. We sat for quite a while and it became apparent that we were not going to be getting good service. They honored our request to be moved to the main room where we’d be able to see and hear the live music. Service continued to be very slow but the music made it enjoyable. 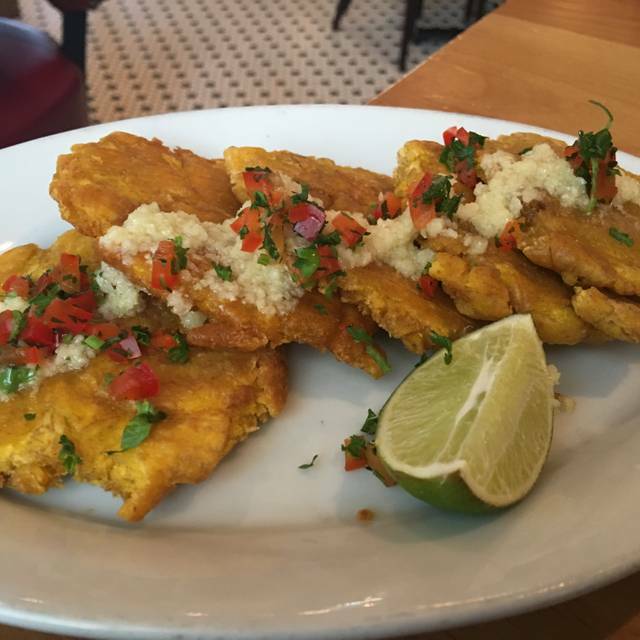 I highly recommend the tostones appetizer. The shrimp in garlic was really good too. Cuban sandwiches are the best in Chicago... fruit margaritas seemed watered down. Food was good , service was meh, but I didn’t expect it to be since it was a busy night. The environment was great! The whole set up is great. We all felt like we were in Cuba. Great food, drinks and Live Music. I would reccommend this place to anybody that would like to Experience a moment in Cuba. The Servers were kind and Courteous we were even lucky enough to meet the owner. A true gentleman. There desserts and coffee are also amazing! We enjoyed our lunch at this Cuban restaurant. The food was tasty, servings ample, and service prompt. The negative was the noise: the music was too loud, and the overall noise level wasn't acceptable. We asked to be moved but speakers are all over. If you're looking to be entertained by music and TV screens, this would be a fun place for you, but it's not a good selection for quiet conversation. Cuban sandwich among the top ten in the country! The accompanying chips however had an off night... 1/2 were fresh and crispy and 1/2 were limp and cold. Was Celebrating my sister's bday, the band was awesome but a lil bit to loud for conversation. Even the owner and his guest came over to our table to wish her happy birthday and danced with us. I loved the energy in the place. 90 Miles is a fun, energetic, high energy blast. I Loved the music, the dancing and the great atmosphese! Tried a variety of offerings. Food was excellent. Service was a little slow. First time patrons. Would definitely go again. They were very accommodating due to changes in group size. The staff was very friendly, food very good, and we all had a blast.